Hobrecht Lighting stopped manufacturing its own line in 1964 and concentrated on gathering the best selection of fixtures available from around the world. In 1972, the legendary lighting showroom experienced an exciting change when Carolyn and Stan Paul purchased Hobrecht Lighting. The Paul family has carried on the tradition of offering the highest quality and largest quantity of lighting fixtures in the area. 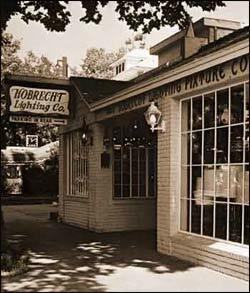 In order to solidify its position as the largest lighting showcase in Northern California, Hobrecht Lighting moved from its original location on J Street to the current location in 1988. The move to the 18,000 square-foot location more than tripled the size of the original lighting showroom, making Hobrecht Lighting Co. the largest lighting showroom on the West Coast. Just as the Hobrecht Family passed on its mission and traditions through the family, so has the Paul family. Stan and Carolyn’s son, Eric, is now the general manager of Hobrecht Lighting and has presided over a total redesign of the historic lighting showroom. Hobrecht Lighting now carries such notable lines as Fine Art Lamps, Metropolitan, Cristal, Schonbek, Illuminating Experience, Renaissance, Emerson Ceiling Fans, and over 250 more! Eric has worked to increase the number of seasoned lighting and furnishing professionals at Hobrecht Lighting, overseeing a staff with over 200 years of combined lighting experience. Hobrecht Lighting will continue to offer unmatched quality, selection, and service throughout the next century, so stop by and experience the difference Hobrecht will provide for your lighting needs!